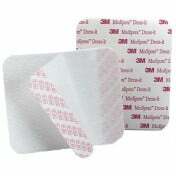 3M Medipore H Soft Cloth Surgical Tape provides more gentleness and stronger adhesion for more challenging applications than the standard Medipore Tape. Medipore H is a hypoallergenic, latex free, flexible tape. It is non-woven polyester, soft, and highly conformable. It is excellent in adhering to gentle to skin so it reduces the risk of skin irritation. It’s comfortable, porous and breathable. It stretches to accommodate swelling and movement. This medical tape is perforated so that you can tear tape off the roll by hand. The tape is easy to handle, with or without gloves. It’s edges resist curling and it’s less likely to stick to itself. It is particularly useful for securing wound dressings, tubing and catheters, and repeated applications where preservation of "at risk" skin is critical. The same soft, latex-free, hypoallergenic, conformable tape as standard Medipore tape, but with increased gentleness and stronger adhesion for more challenging applications. Available in perforated rolls in several sizes. Medipore Tapes have the same non woven, polyester backing. The difference is in the adhesive. 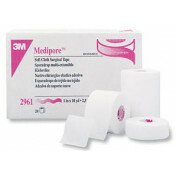 Medipore H Tape uses an adhesive from the 3M Tegaderm Transparent Dressing family. 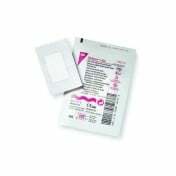 The tape uses a thin layer of the same adhesive used on 3M Durapore Surgical tape. Although the tape has a higher level of adhesion, it is often more gentle upon repeated taping than Medipore tape. More gentle than Medipore tape. When repeated taping is needed and preservation of "at risk skin" is critical. Securing over areas where skin may stretch (e.g., edema, distention, hematoma formation or movement). Start with clean, dry skin. The tape sticks best to clean, dry surfaces so try to minimize moist conditions as much as possible. Touch the sticky surface of the tape as little as possible. Place the tape without tension onto the skin. Encircling a limb completely with tape may become hazardous to blood flow. The adhesive on the surgical tape is "pressure sensitive" meaning it's designed to adhere best when gentle, but firm, finger or hand pressure is applied rubbing the tape into place. Your skin has bumps, Even smooth skin has peaks and valleys. Laying a piece of tape on the skin without applying any pressure only provides a superficial adherence at best. Usually, the stickier the tape, the less pressure you should need. Gentle strokes along the tape allows the adhesive to be exposed to more of the skin surface. Medipore H Surgical Tape is Soft durable tape that is both latex free, hypoallergenic and preferred in hospitals around the world as a trusted surgical tape. Speaker 1:	Two special taping situations require extra care when compression is needed and when distension is anticipated. There are situations when compression of a side is desired. Unfortunately, some conditions routinely attempt to achieve compression by strapping the tape on skin causing sheer intention. Apply it this way, tapes with non-stretch backings exert continuous tension on the skin, weakening the connections between epidermis and the dermis. This may result in blistering and skin tears. Even tapes that have stretch often have memory and tend to pull back into their original shape. This too exerts tension on the skin. Watch. See it pull together there. When tape has been strapped, it is removed, weakening the epidermis may also result in skin stripping. To help avoid these problems remember that compression is a function of both the tape and the layers of dressing material. You may apply a soft cloth tape such as medipore tape in the usual manner, to stretch or using micro-foam tape. Place the first section of the tape on the skin without tension gently pressing downward. With one hand, secure the tape on the edge of the dressing while slightly stretching the next section of tape over the dressing. Secure the tape on the opposite side of the dressing then place the remaining tape on to the skin without tension. When done properly you will note a narrowing of the tape over the dressing. An alternative is to start the compression on the center of the dressing, stretch the tape to either side but make sure that the tape attached to the skin is applied without tension. Speaker 2: Another special circumstances when distension, edema and or movement are anticipated. If the skin contour under a tape increases and the tape is unable to accommodate that change because its backing does not stretch, the same problems that applying with tension may occur. Speaker 1:	If distension is anticipated, use a tape that stretches or a self-adherent wrap to secure the dressing or tubing. Foam tape generally stretches in all directions. However, non-woven soft cloth tapes such as medipore tape stretch in the cross direction and on the biased but not lengthwise. The direction of the stretch should be considered when securing the dressing or tubing to an area that is at high risk for distension. Anecdotally, applying soft cloth tape parallel to the incision with the stretch medial and lateral rather than proximal and distal appears to be associated with fewer skin tension injuries than taking perpendicular to the incision. Reassess your tubing and dressing security every shift and as needed. You may need to change tape more frequently if the area is moist, stressed or if distension occurs. How many medicare billing units in the Medipore 2 inch Soft cloth tape 10 yard roll. We do not work with Medicare for billing information. You'll have to contact medicare directly for specific answers. 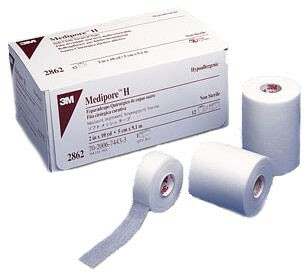 Ordered the 2861 2pack Medipore 3M soft cloth tape. Received 1 roll of what looked like regular clear tape. I only paid 6.08 + shipping so I just ordered same from a different supplier and received the correct tape. As far as the Medipore tape itself, it is excellent for helping puppies ears to stand and it truly works. 5 stars for tape. 0 for company. Great tape. Great price. I'll order again from this company. i like this cloth tape, it sticks well, breathable, flexible & doesn't leave any sticky residue like others. & i like it where it has places you can tear off instead of cutting it. Great product. Same exact products they used in hospital. Great product. Conforms and sticks to unconventional wound sites. Water and sweat resistant. Will reorder. Great order response and lightening shipping. I was very pleased to see how much cheaper this tape was from this company compared to other places. I almost made the mistake of order this very same tape from another medical supply at almost double the cost. Then I decided to look at this site and found it was nearly half the price. I ordered this tape on a Friday and received it the following Monday which was another great surprise as to how quickly it was shipped. I would definitely recommend ordering from this company. I have used Medipore tape for the last five years. Its the only tape on the market that doesn't come off when wet. I use it every day to hold my ostomy pouch in place. It has been the only tape that doesn't irritate my skin. This site has great prices and fast service. Works perfectly without irritation...excellent quality and price...and great service! This tape is very gentle on your skin. I have to use it all the time for something problematic and chronic. It comes off very easily, but stays on where needed. I have used this tape for the last 2 years and nothing else seems to work as well. This is the most gentle tape for your skin I have ever found, especially when you have to use it all the time for something chronic. Sometimes when you take it off the sticky stays on you, but it comes off very easily. I have used this tape for the last 5 years at least, maybe longer. I have to bandage all the time and I would not use any other tape.